→How Often Should You Clean Your Ar-15? Figuring out the "best" time to clean the AR-15 is one issue that seems unresolvable to many shooters (especially casual owners). If you were to ask every owner you came across in the country, you will probably be surprised at how varied their responses would be. 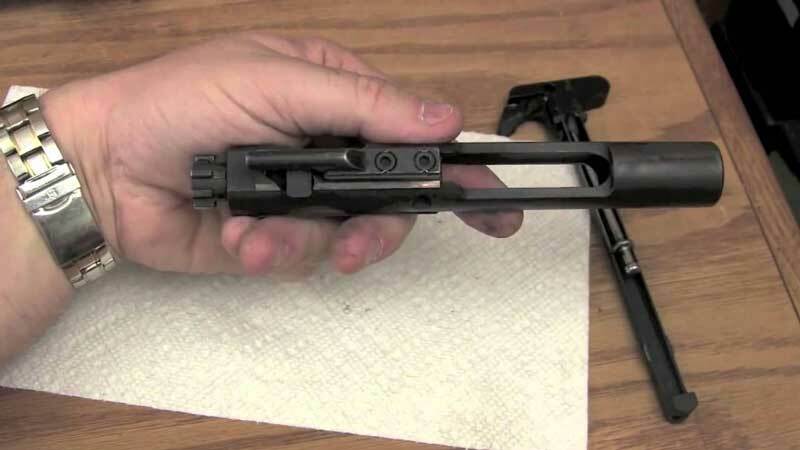 Some might insist to clean the firearm every time they use it; some might suggest performing a monthly routine maintenance whether the gun has been fired or not; some might tell you there's no need to clean the gun if it's not being used. Some might even suggest not cleaning the gun at all even after taking many trips to the range. We can go on and on and never arrive at what seems to be the "right" answer. However, we do recommend cleaning your gun your AR-15 instead of letting it sit. This is because the process of firing any firearm is usually DIRTY and even if you're going to allow it lie in the cabinet for a while, it would be at the expense of its reliability. The amount of attention most people give to their firearms has to do with everything they were taught the first time they handled the weapon. As indicated above, some people believe that, like any other gun, the AR-15 should be able to deliver every time with little or no cleaning while others hold a contrary opinion with emphasis on utmost care and attention. Wherever you stand, it is important to realize that your AR-15 is a huge investment - one that can be passed to future generations as a legacy. Being an instrument of personal defense, it's also expected that the weapon will deliver every time you need it. So no matter how you look at it, your AR-15 needs to be properly cleaned and maintained in order for it to remain fully functional. But The Question Still Remains: How Frequent? Before we delve into that, let's see what can happen if you fail to lubricate and clean your AR-15 frequently. Now that we know why cleaning is such an important activity for the proper maintenance of the AR-15, we can now answer the largely contended question on how often you need to carry out cleaning. The truth is that there is no specific schedule for cleaning the AR-15. Instead, it depends on what you are using your weapon for as well as the elements it's being exposed to. The kind of ammunition you are using also plays a major role. If your AR-15 is frequently exposed to moisture, then you definitely need to clean it immediately after usage. Leaving your rifle at the mercy of the elements can easily lead to rust, excess wear and tear and other damaging effects. As these hampers performance as well as the effectiveness of the weapon. In some cases, the gun can fail long before its estimated lifespan is due. So when next you go out to hunt with your AR-15 in a cold weather, make sure you scrub the gun when done to get rid of all the dirt and moisture trapped within. Don't allow it to stay - not even for a day. It is very important you do this not minding the fact that most parts of the AR-15 are made from quality materials that are able to withstand the damaging effects of the elements to some extent. This will help ensure the more susceptible parts are not exposed while the overall quality of the gun material is preserved. However, if your AR-15 is only engaged to make holes in paper or target clays, then you don't need to lubricate it every time you use it. In such situation, you should thoroughly clean the gun after three or four trips. But these should be within a few months because anything more would result to fouling. Leaving your weapon for long without maintenance is generally not advisable even though you're not using it. It is also possible you're keeping your AR-15 for personal defence. In this case, you must always keep the weapon clean and well lubricated every time to avoid reliability issues due to fouling. You don't want it to fail at the most crucial moment. Keeping to a monthly cleaning schedule is OK since the gun is going to be staying in the drawer most of the time. Remember, you don't lose anything by cleaning your rifle after every outing - the weapon doesn't lose either. In conclusion, we recommend performing a detailed cleaning at least once a year even if the rifle doesn't ever make it out of the cabinet. By "detailed cleaning", we mean dismantling the gun to carry out in-depth cleaning and oiling. If you're a hunter or tactical shooter, then we encourage you to repeat the procedure twice to take care of the additional troubles. Apart from the purpose of cleaning, tearing down your AR-15 also gives you the chance to inspect the weapon for possible problems which you may not ordinarily detect. So when cleaning, make sure you look out for things like rust, cracks, corrosion and others. And replace the defected part if you have to. Don't give any chances or risk having your rifle fail when you least expect. Finally, also pay attention to the kind of storage you use for your weapon. Make sure the environment inside and outside the gun safe or cabinet is convenient. The area outside should be well ventilated while the interior should be free of moisture in the air to avoid rust. You might want to apply a desiccant to reduce humidity.